Colorado Springs is a city regarded for its active, outdoor lifestyle. Cordera fits that description perfectly. Author’s note: I’d like to start by saying that I am not affiliated with the developers or builders of Cordera. 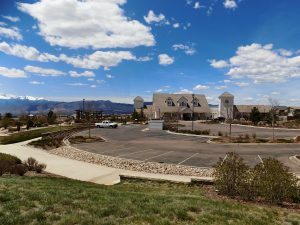 This is a blog about the communities and builders that I believe are making a positive contribution to the Colorado Springs area. Cordera is ideally positioned to provide fantastic views of Colorado’s world famous Front Range, including Pikes Peak. What’s more, this one-of-a-kind single-family community has pretty much everything you could want in your Colorado lifestyle. Of course, shopping and dining are close by. Access to transportation corridors is also a “ten” at Cordera. Plus, your children can walk or bike to school at Chinook Trail Elementary, located inside this neighborhood. 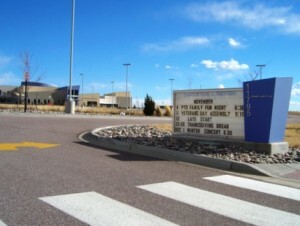 This school is part of Colorado Springs District 20, a top rated school district in the region. Location, location? Sure, Cordera has that covered. but, at close to two decades in the business, I’d have to say that amenities protect and propel value JUST as much as location, especially these days. You’ll find those amenities here, including an 8,000 square foot Community Center complete with a heated outdoor pool and fitness room. Take a stroll through storybook-themed parks and several miles of interconnected trails. Pedestrians can even use an underpass to access shopping, trails, and more. Truly, when you choose to live here, you will experience the best that Colorado Springs has to offer. Call me to see it all today. We’ll compare the wide array of choices, from existing resale homes to new construction, in order to find the best fit for you and yours. Children walk to school at Chinook Trail Elementary, which is located right inside the community. It’s no wonder that Cordera has been voted one of Colorado Springs’ Premier Master Planned Communities. This neighborhood has beautiful single family homes offered by a number of award-winning local builders, priced from the $300’s to the $800’s. Attention to architecture is a focus here. You’ll find homes crafted in Cordera that derive inspiration from a range of historical and modern architectural styles, coming together in a timeless way. Cordera offers an impressive variety of new homes and best of all, this community is only halfway completed. Check out the unique landscaping promotion, flawless architecture, and best of all, ENERGY STAR certified construction. The developer literally has kept an eye on everything. So it’s really no mystery that the home buying public picked Cordera a few years ago as Colorado Springs’ Best Master Planned Community. Simply stated: Cordera in Colorado Springs is a Great Place to Call Home. What about the builders? Great communities keep great company. The hand-picked home builders include Keller Homes, Campbell Homes, Vantage Homes, Saddletree Homes, Creekstone Homes and Symphony Homes. Every one of these names is well known and trusted to us Realtors in Colorado Springs, for a host of good reasons. Keller Homes: The president of this fine company is a West Point Graduate, and attention to detail is apparent in all that Keller does. Keller’s home plans are constantly being evaluated for customer feedback and improvement. The plans are extremely livable with good flow and the right balance between value and features. 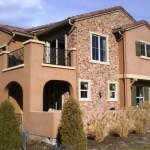 Keller Homes is a builder that responds to its customers. Vantage Homes: “We are in the people business, not the building business.” This is Vantage’s perspective on the quality homes they build. There is a strong focus here on safety and the environment. Vantage has won Best of The Springs along with many other awards over it’s successful history. Campbell Homes: A Colorado Springs based builder with 50 years experience; Campbell is all about excelling at Energy Star ratings and building beautiful homes designed for today’s active lifestyles. Campbell Homes has been awarded the Housing and Building Association’s Builder of the year award three times, a unique distinction. Saddletree Homes: A Colorado Springs new home builder since 1993, Saddletree Homes is known these days as one of the most regarded El Paso County builders. Saddletree has amassed a long list of awards from the public as well as the homebuilding industry, including Parade of Homes and MAME. The founder and president, Lee Bolin, is now one of Colorado Spring’s most respected and well known home builders. Saddletree can do customization on its homes that others simply can’t. Creekstone Homes: This fine company brings 20 years of experience to the table, and is the largest female-owned Colorado homebuilder. The list of MAME awards their plans have received is very extensive and makes perfect sense given the stylish and thoughtful elements that are the hallmark of Creekstone. Symphony Homes: Some of the best homesites in Cordera have been reserved by Symphony Homes for custom and semi-custom offerings. A division of Saddletree Homes, Symphony is already backed by an impeccable reputation up and down the Front Range of Colorado. Cordera’s developer says, “The Rest is up To You.” The reasoning behind this statement is simple; they listened carefully to today’s buying public and researched every aspect of exceptional neighborhood design. All of this information and insight have culminated in this community, the result of meticulous attention to detail yielding a practical and elegant solution: Cordera. I’d declare this one to be a must-see for any buyer considering lifestyle-oriented communities in Colorado Springs. Let’s compare the homes and amenities in Cordera with other neighborhoods to find that perfect place for you.